Shop signed Ajax shirts, boots, balls, gloves & autographs photo displays. All Ajax FC autographs come with Free UK delivery, fast worldwide shipping and a Certificate of Authenticity. Many also come with a photo of the actual signing! Dutch giant Ajax is a club that surely needs no introduction…but here goes! Widely recognised as one of the most successful football clubs in the world, Ajax FC (also known as Ajax Amsterdam) has been one of the most feared football teams in Europe and in the Netherlands for over one hundred years. Ajax was founded in 1900 in culture capital Amsterdam. Within a decade the club had achieved promotion to the highest level in Dutch football, securing its first major success in 1917 upon winning the KNVB Beker. Ajax is a formidable force to be reckoned with in any competition. At home in Holland, they have continuously played in the Dutch top division Eredivisie since its inception in 1956. They have a total of 33 Eredivisie titles and 18 KNVB Cups. Although it is on the European stage that they are perhaps most well-known. German magazine Kicker claimed they were the second most successful European club of the 20th century – a title partially backed up by the IFFHS, who ranked them in seventh place. They were also awarded the World’s Club Team of The Year in 1992. 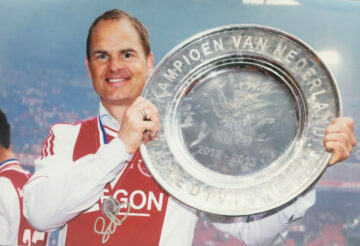 Ajax has many titles to their name, including 1 UEFA Winners Cup, 1 UEFA Cup, 3 UEFA Supercups and 2 Intercontinental Cups. They have won the Champions League 4 times, and the Europa League once. They are also one of only three clubs in the history of football to have won the European Cup and Champions League titles three times consecutively. Many Ajax players go on to represent their respective nations on the world stage. Our signed Ajax FC shirts, boots, balls & photgraphs offers something for everyone, autographed by the squad’s most prolific stars and most successful players. Browse today to celebrate one of the world’s most prosperous football clubs, or simply add to your existing collection.